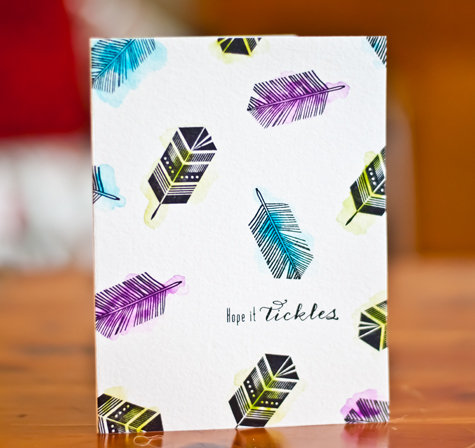 Today I am sharing a fun way to color cards, while keeping the design simple. This design works best with open images used to make a casual card. 1. Cut watercolor paper to 8.5" x 4.25". Score and fold in center. 2. Place folded card in die cut machine, run through to flatten. 3. Stamp sentiment first. See the fruit card? The original sentiment I used was tiny and looked odd. I used a larger sentiment and stamped on black cardstock for contrast. 4. Stamp images in a random fashion surrounding the sentiment. 5. Wash some watercolor paints over image. Staying in lines discouraged! 6. Add bling, etc. as desired. 7. Once dry, run folded card through die cut machine again to re-flatten. Fabulous cards!! Love the graphic feel! What brand of watercolor paper do you use? Thanks Dana. This is Arches cold pressed watercolor paper in a pad. I asked for watercolor paper for Christmas and this is what my husband picked out. We were at a Michael's in Texas at the time!! I love it.. but I'm using it up rapidly! Joan, Thanks!! I'll have to see if my Michael's has it!! I love the carefreeness (that is a word, right?! tee hee) of these 3 cards. I am so trying that this week!! Thanks, Chris. It is meant to be carefree and happy. 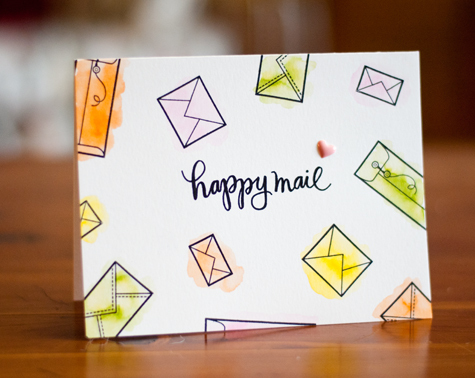 It wouldn't work for a sympathy card, but is a fun and easy way to use our many stamps! I just love how this looks! I've been trying to make myself do something along these lines with the casual watercoloring, but can't seem to get there. You are encouraging with these very cool cards! Love all 3 cards, looks super! This is such a great look. 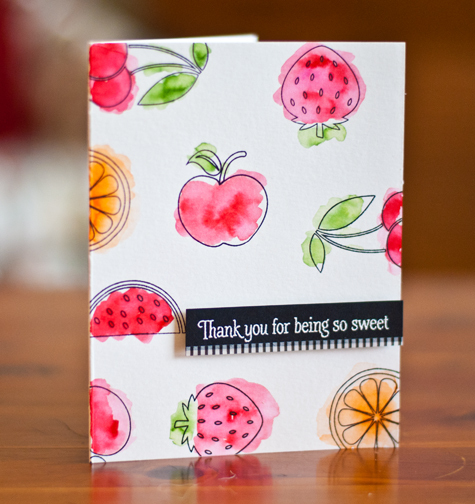 I like the pinks and oranges on the fruit especially but all three cards are sweet and fresh. Love how these fun cards turned out....great job. Beautiful watercolor wash cards! And... a great tip re: watercolor paper!